In his latest TED talk (Technology, Entertainment and Design), Al Gore, founder and chairman of The Climate Reality Project, poses three questions that will determine the future of our planet. He explains why – even in the face of rising seas and melting glaciers – we can dare to dream of a safe and sustainable future planet. Here are some facts and challenges from this talk that are worth sharing. QUESTION #1 – DO WE REALLY HAVE TO CHANGE? YES. And we must. Change is a moral imperative in order to ensure our planet is habitable for our children, their children, and generations to come. QUESTION #2. CAN WE CHANGE? Burning fossil fuels is one of the key drivers of climate change, and it is the one that Al Gore chooses to focus on. 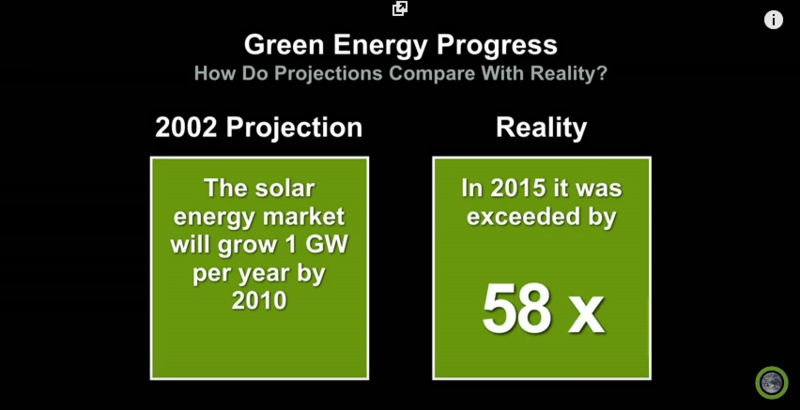 Despite our continued reliance on coal, oil and gas, renewable energy is growing exponentially. It has outpaced expert projections time and time again, largely because of its ability to compete in the marketplace. With all this expansion, the renewable energy transition could very well be the biggest business opportunity in the world right now. FINAL QUESTION #3. WILL WE CHANGE? As Al Gore says, this question is up to us – all of us – right now. Events such as the Paris Agreement on climate change, show commitment to greenhouse gas reductions. Around the world, from China to India to the US, countries are adding more and more capacity in renewable energy. In fact, 69 percent of new electrical capacity added in the US last year came from renewables, despite massive subsidies to fossil fuels. Gore concludes with examples of how, time after time, we have experienced meaningful change in this country because the people had the will to push through the opposition. This video shows that change is happening – what’s up to all of us right now is how long we take to push through the opposition and bring about a new, clean, energy future.